You are at:Home»Herbs»Withania somnifera Dunal. 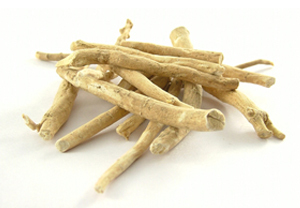 Ashwagandha root is a herb of the ages. It is the ‘ginseng’ of Ayurvedic medicine, the traditional medicine of India and is considered an ‘adaptogen’, a term used to describe herbs that improve physical energy and athletic ability, increase immunity to colds and infections and increase sexual capacity and fertility. One reason for ashwagandha’s reputation as a general energy-promoting, disease-preventing tonic may be its effect on the immune system. A number of studies have shown significant increases in white blood cell counts and other measures of strengthened immunity in rodents given ashwagandha or certain chemicals extracted from the herb. Ashwagandha may also have a mild sedative effect on the central nervous system and in animal studies it has been shown to be a muscle relaxant. It is commonly used to increase vitality, particularly when recovering from chronic illnesses and pain management for arthritic conditions. Ashwagandha may also help regulate blood sugar which aids in suppressing sugar cravings. Research shows ashwagandha may be a promising alternative for cancer treatment and prevention. Ashwagandha seems to show positive effects on the endocrine, cardio, and central nervous systems. It is one herb that could help your body produce it’s own thyroid hormones. Preliminary studies indicate that the herb helps to reduce the negative effects of stress, slow tumour growth, treat anxiety and insomnia, and reduce cholesterol in addition to increasing sexual performance. Ashwaghanda is generally safe at the doses recommended on the packaging. In high doses it may have steroidal activity similar to Creatine. Recommended Dosage : 3 to 10 g powder of root.